If Mama Cow Ain’t Happy, Ain’t Nobody Happy! If your dairy cows are not meeting your expectations, you may want to invest in an air-conditioning unit for the cow clubhouse— especially for the females who are expecting and keep that thermostat set fairly low. The results may be well worth any hikes in the electric bill. According to a new UF/IFAS study, calves conceived in the winter later produce more calves and milk. That bit of information is quite helpful for those in the dairy business — and their customers. And that does include Floridians. The study says there are about 124,000 dairy cows in the Sunshine State. That amounts to quite a bit of milk. Each Floridian cow produces an average of 2,408 gallons of milk annually. Researchers who have determined that cool and comfortable conditions result in happier, higher-producing cows say it is key information. Scientists examined 667,000 cow lactation records for the years 2000 through 2012 for the study. The information came from the Dairy Herd Information Association database. Researchers also drew in weather data from the National Oceanic and Atmospheric Administration. 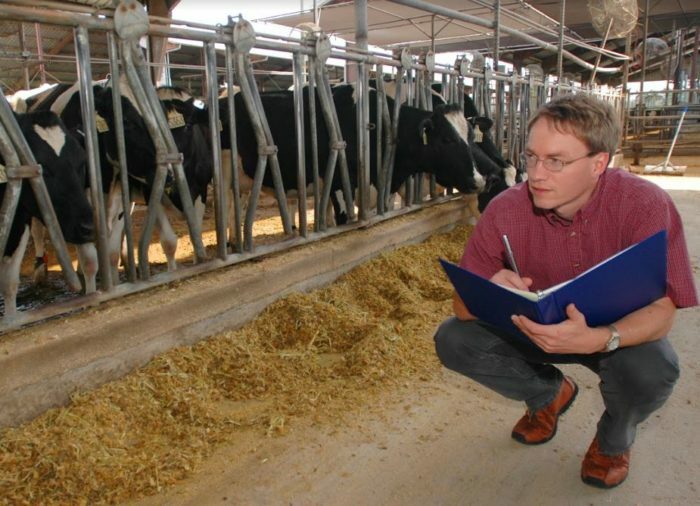 The study is published in the Journal of Dairy Science. The results show there is no question about it: Hot cows are stressed-out cows. Researchers say a heat and humidity index that is higher than 68 can cause heat stress in the cows. Through these records, De Vries and lead author Pablo Pinedo of Colorado State University documented what happens when cows experience heat stress during conception, in terms of the calf’s performance when it becomes a cow. A calf grows into a cow about two years after birth. They found that calves conceived in the cool season fared better from first day of their pregnancies. Now researchers want to know whether the biological mechanism causes that effect on day one, or later. “Perhaps we can do something during early gestation, even if the mom is still under heat stress,” De Vries says. Either way, one thing is for sure – a hot mama is a stressed mama, and nobody wants mama stressed!